I am Asaf, a resident of Berlin since 2007 and a professional tour guide in the city since 2010. After living, working and studying tourism in Israel, Poland, China and New Zealand I ended up completing a BSc in Ecotourism in England, for which I conducted research in Ethiopia. In December 2006 I decided to fly to Berlin, a city I heard so much about from my grandpa, to examine it as a place where I could develop myself and maybe grow old in. Quite a lot of water flowed down the river Spree since: I’ve completed a master degree in Integrated Natural Resource Management at Humboldt University, and most recently engaged in PhD research of dark tourism. For my research I explore the way tour guides interpret the dark chapters of Berlin’s history. As a guide I am very much influenced by the many historical layers of this fascinating city, as well as by childhood memories of my grandmother’s German food recipes and my grandfather’s listening to German composers he loved from his own childhood. Over the years I ventured to guide also in the Saxony’s Dresden and Leipzig, in the memorial site for the former concentration camp Sachsenhausen (where I am a registered guide), in the picturesque neighbouring Potsdam, and also in Hamburg. 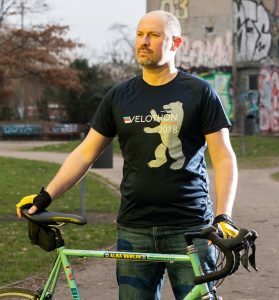 In addition to guiding in the city, I am also the founder and owner of cycling-berlin-brandenburg, offering guided cycling adventures in Berlin and in the wonderful federal state of Brandenburg.